WINSTON-SALEM, N.C.--(BUSINESS WIRE)--Krispy Kreme Doughnuts will turn its Original Glazed® doughnut green (again!) and reward thousands of fans with FREE doughnuts for a year during this year’s St. Patrick’s Day Weekend celebration. Krispy Kreme is bringing back its popular “O’riginal” Glazed doughnut, a St. Patrick’s Day twist on the brand’s iconic doughnut with specially formulated green dough. The doughnut will be available throughout the three-day celebration, Friday-Sunday, March 15-17 at participating shops in the U.S. The fun doesn’t end there. 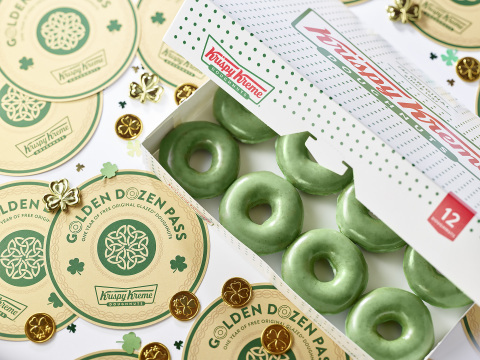 For the first time, thousands of lucky Krispy Kreme fans will win a “Golden Dozen Pass” worth FREE Original Glazed® doughnuts for a year – one dozen per month through St. Patrick’s Day 2020. Multiple customers will win a Golden Dozen Pass each day at every participating shop. To find a participating shop near you and review giveaway terms and conditions, visit www.krispykreme.com/stpatricksday. Can’t make it to a Krispy Kreme shop? See giveaway terms and conditions on how to enter to win a Golden Dozen Pass via mail. Don’t forget to share your excitement for the O’riginal Glazed doughnut and Krispy Kreme’s Golden Dozen Pass with friends by using the hashtag #KrispyKreme and tagging @krispykreme.